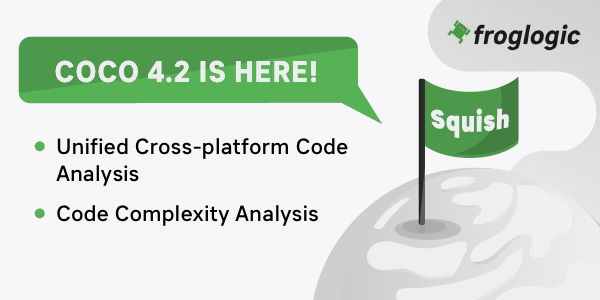 The froglogic team is proud to announce the Squish Coco 4.2 release. This version introduces new metrics for the Code Complexity Analysis: McCabe and eLOC. Furthermore, it comes with a feature to unify the Code Analysis of Cross-platform applications. Squish Coco is a complete C, C++, C#, Tcl and QML code analysis tool chain for a wide range of platforms, compilers and targets including Windows, Linux, macOS, Unix and embedded systems. QA and development departments use Coco to analyse their test coverage and complexity of their source code. The McCabe’s Cyclomatic Complexity metric is a static measurement of the complexity of a program. It indicates if the program has too many branches and control structures. The eLOC (effective Lines Of Code) metric is also statically measured. It shows the quantity of lines that produce executable code. These metrics complement Coco’s existing code coverage metrics and help to increase the quality of your application’s source code. When it comes to the measurement of code metrics, cross-platform testing is a problem of its own. Measuring the code coverage on different platforms typically leads to separate reports for each platform. The latest Coco release unifies the coverage measurement for cross-platform applications. It merges the results, no matter which platform or compiler you are running. Let Coco simplify your analysis and reporting! Customers and existing evaluators can find Squish Coco 4.2 packages in their download area. New evaluators are welcome to request a free and fully functional trial please complete the form below. froglogic GmbH is a software company based in Hamburg, Germany with additional offices in the USA and Poland with over 3,000 customers world-wide. froglogic is well known for its automated testing suite Squish with its flagship product Squish GUI Tester, the market-leading automated testing tool for GUI applications based on Qt, Java AWT/Swing, SWT/RCP and JavaFX, Mac OS X Carbon/Cocoa, Windows MFC, .NET and WPF, iOS Cocoa Touch, Android and for HTML/Ajax/Flex-based web applications running in a variety of web browsers. In addition, froglogic offers the professional, cross-platform C, C++, C#, QML and Tcl code analysis tool Coco Code Coverage.